From previous posts, we know that people as social beings often communicate in stories, that stories convey emotional resonance as well as information, and that compelling stories often contain villains, victims, and heroes. But how do you actually tell a story? 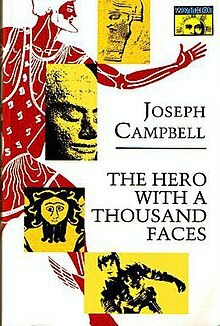 Joseph Campbell, in his classic study The Hero With A Thousand Faces, draws from cultures around the globe and thousands of years of mythology to uncover the structure of the prototypical hero story. Along with creation myths, hero stories form a large portion of mythology and cultural storytelling. There are several permutations of the hero story, depending on the hero’s actions at key decision points in the prototypical story structure, and the outcomes of those actions. One permutation, presented here, is well suited to organizational storytelling. Disharmony: Our hero notices that something is wrong in the world. This could be as grand as Siddhartha Gautama, the sheltered prince who would become Buddha, first noticing suffering in the world. It could be as mundane as Robert Kerns noticing the need for intermittent windshield wipers. Invitation to adventure: Our hero receives an invitation to step out of the disharmonious world, to go on an adventure. This can be dramatic and obvious as in The Hobbit, when Gandalf the wizard appears at Bilbo Baggins’ house and invites him on an adventure to slay a dragon. In Marilyn Martin’s story in my first storytelling post, her witnessing the scene with the gang members and the child playing violin was her invitation to the adventure of studying the impact of music education. The quest, monsters, and helpers: Our hero travels on a quest. Along the way, he or she encounters a series of tests such as monsters, riddles, or insurmountable barriers. By overcoming the tests, our hero gains skills, tools / weapons, and confidence. Helpers also appear along the way–specially endowed characters who give crucial aid to the hero. Jesus was tested many times during his missionary travels throughout Israel. Along the way, he gathered 12 disciples who helped him spread his message. Theft of the magic elixir: Having built up knowledge, skills, and wisdom along the quest, our hero comes to the final challenge: the theft of the magic elixir. This potion has the ability to restore harmony to the hero’s home. It could be a liquid, such as the nectar of the Greek gods or the communion wine of Christianity. It could also be some other form of magic or magic-seeming item, such as new technology (fire from Prometheus) or new knowledge / enlightenment. Returning home to restore harmony: With new magic in hand, our hero returns home to restore harmony. That return can be easy, escorted by the gods or a magic flight. It can be as arduous as all the previous tests. In the next post, I’ll talk about how to apply this story structure to your public service organization. The reason we respond to anything — Steve Job’s creating the iPhone after a stint in the wilderness to Trump’s improbable rise to power –is because there is a compelling *story*. Everything else is just random collisions of atoms.